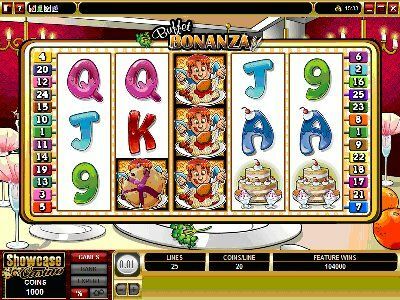 BUFFET BONANZA, the latest 5 reel, 25 pay-line Video Slot to debut at Villento Casino, will have foodie fans taking a fridge-break - when they can drag themselves away from this multi-featured and highly entertaining new game. Featuring Wilds, Scatters, re-triggering Free Spins and a Buffet Bonus feature with Extra Wilds, the game has a theme that is a gourmet's delight, with a mouthwatering feast of decadently delicious roasts, desserts and pastries in brilliant color, offering the player ample opportunity for reward. The two symbols to look for on the reels are the Diner, which acts as the Wild, and The Buffet Bonanza logo that acts as a Scatter and triggers Free Spins galore, both leading to improved rewards through several different elements. 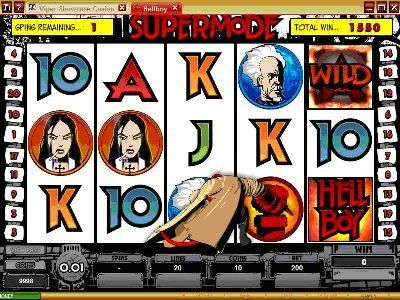 The Diner symbol only appears on reel 3 in the main game, but when it does a cornucopia of opportunity opens up as the Buffet Bonanza feature starts, stacking extra Wilds across all positions on the reel and helping the player build winning combinations. But we're not done yet - during this phase of the game the software generates a pie-fight, randomly throwing pies at the symbols on the reels and changing these into Diner symbols and even more chances to score. In Scatter mode, three Buffet Bonanzas across the reels trigger 10 Free Spins where all wins are doubled...and re-triggering is possible. And as an added reward, Diner (Wild) symbols are also added to reels 2 and 4 for the duration of the Free Spins. Rounding off all this excitement and suspense is the popular Gamble feature in which players can double or quadruple their wins by correctly predicting the color and suit of the next card. The wagering range on Buffet Bonanza will suit all pockets, from 0.01 to 0.20, with a maximum bet of 100.00, from which the player could win 24 000.00 in the base game, and double that on the generous Free Spins. Remember back in the 'nineties when Mike Mignola's imaginative comic book creation Hellboy electrified the action hero world, growing into a movie, DVD and comic book phenomenon that still enthralls? Well, Villento has its own unique take on the best-seller in a new 5 reel, 20 pay-line video slot dubbed simply HELLBOY. Licensed from Dark Horse Comics, the theme has been faithfully translated into a stunning new slot by replicating the comic book style of presentation, featuring such iconic characters as Prof. Trevor Bruttenholm, Johann Krause, Abe Sapien, Liz Sherman and all the others, led by the stone-fisted and de-horned red demon-for-good himself. Hellboy is the Wild in this game, helping players to win profitable combinations by substituting for other symbols, whilst his oversized stone fist is the Scatter, more importantly triggering the thoroughly entertaining Underworld Bonus. This is a four-level second screen bonus feature where the player has to avoid blocked tunnels in the search for other team members and reward, encountering weird beasts along the way. Players who complete all four levels and reach the Chamber of Fire get the added rewards of the Relic of Power. This exciting subterranean feature can also be triggered in Supermode, a randomly awarded Free Spin bonus of ten spins which carry up to 3 Held Wilds. For players with any adrenalin left after these thrilling features, there is the Gamble feature where wins can be doubled or quadrupled if the correct card suit or color is predicted. The betting range on Hellboy suits every pocket, running from 0.01 to 0.25 with a maximum bet of 50.00, which can generate rewards of up to 25 000.00 in the base game, the same on Free Spins and 8 400.00 on bonuses. This is truly a big game, with big monsters, larger-than-life heroes and plenty of action - try your luck on Hellboy now at Villento Casino. The theme of this Microgaming video slot will remind players of those great nights at packed rock concerts, where the lights, the urgent, driving music and the ambience marvelously entertained and the hours flew past in no time at all. GET ROCKED! is a 5 reel, 30 pay-line game that will do the same, capturing online the energy and magic of rock 'n roll concerts and combining it with an irresistibly entertaining mix of Wild, Scatter, Free Spins, Multiplier and Gamble action....and two different bonus opportunities. This 5 reel, 20 pay-line game is themed on an exclusive top-of-the line spa, where the player earns gold tokens through a thrilling mix of Wilds, Multipliers and Scatters - the more tokens, the better the bonus possibilities. Whenever a gold token symbol shows up in the centre spot of reel 5 it is credited to the player to accumulate or use whenever desired, and if the token is immediately above or below the centre position there's a consolation reward of a 2x multiplier. Winning a single gold token delivers a first level bonus in which the player picks 4 fruit flavors from a selection of eight to reveal a winning mix, and there's a random daily special to boost earnings. Once the token has been received, the player can hit the "Play Bonus" button at any point to activate the bonus feature, or let the token accumulate for use on other bonuses. Players with two golden tokens can access an invigorating hot stone bonus, choosing 2 stones from the five available to uncover a mystery multiplier value. Three tokens gives access to a hot wax treatment where the loudest yell on the Scream-O-meter denotes the prize. 4 Token-holders enter the luxurious hot oil bath bonus, choosing from a range of 15 exotic oils, each with a reward, while the feature lasts, and top earning 5-token winners enter a massage room to focus on a client's back, where up to 25 Free Spins can be awarded from a random dappling selection. Flight Zone is a 5 - reel, 25 pay - line video slot that features the daring military pilots of today tasked with tough missions. 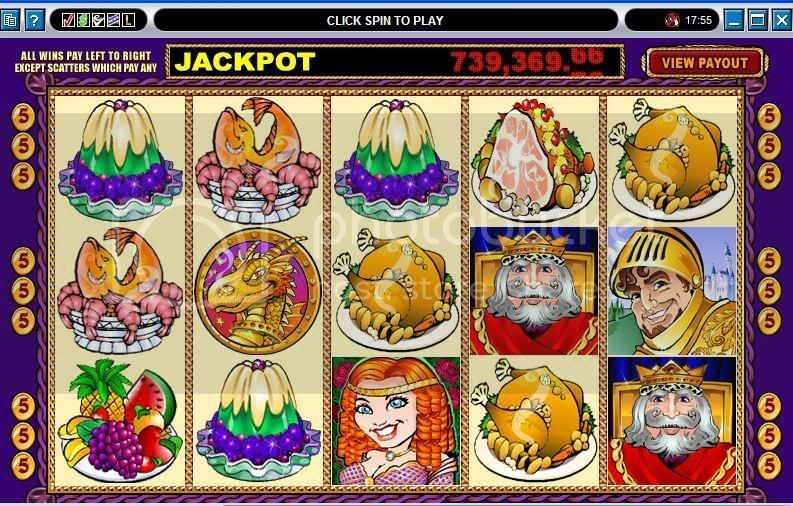 This game is filled with Scatters, Wilds, Free Spins, Multipliers, a two-level Bonus and even a Gamble feature. You will find some of the best graphics around showcasing sleek and lethal aircraft from helicopters to stealth jets and the great men who fly these aircraft on combat missions around the world. The Flight Zone symbol is wild and will combine with other symbols to make winning combinations for you. Free Spins can be re-triggered. This game includes two types of Scatters. The Missile Scatter appearing on reels 1 and 5 will give you 10 free spins where all wins are doubled. When the Mission Scatter appears across reels 2, 3 and 4, you enter the two bonus missions. The first part of the mission you have 3 picks out of 10 to find the 3 atomic fuel symbols which will take you to the second level and the main mission. In the main mission you must choose the main enemy leader out of the choice of 5 mean-looking bad guys. Bet anywhere from a penny a line to as much as 20 cents a line and win up $47,600 in the base game, $95,200 on Free Spins and $3,400 on the Bonus feature when betting the max bet of $100. Included at the end of each win is the Gamble feature where you can double or even quadruple your winnings up to $10,000 by correctly predicting the right color and suit of cards. Chocolate Factory is a 5 reel, 9 line, microgaming, video slot that can be played for a single penny per line up to 50 cents per line with a 5 coin maximum per line play. This slot has two bonuses, a wild, a scatter and a delicious cast of characters too! I really enjoy the animation and sounds of this slot. Each time you hit the "spin" button, it sounds like a piece of candy is plopping into liquid chocolate. The scatter; when it pays; wobbles and kids little voices are in the background as the scatter man tries to balance his candy. The scatter symbol on this slot is the candy maker who balances a tray of cadies high atop his head. Two of these symbols; appearing anywhere on the screen; pays you three times your triggering bet! Get three and it's ten times your triggering bet! The wild symbol of this game is Doctor Chocolate. He substitutes for only the candy symbols (there are 6 candy symbols) in this game. This symbol is also the "big payer" of the game ... get 5 on a pay line and get awarded 8,000 coins!!! The BonBon Bonus Game is triggered when you get 3, 4, or 5 of the bon bon bonus symbols on a pay line. You will be presented with 10 different chocolates. Click on a chocolate to see what your win is. If you get a number value, you continue on to pick again and again and again, until you click one that says "collect" .... that ends the bonus game. The other bonus in this game is the Dunk-A-Treat Bonus. This feature is triggered when you get 3, 4, or 5 of the chocolate vat symbols on a payline. Dr. Chocolate is standing with Candy & Mikey at the vat waiting for you to choose one of 5 treats to drop into the chocolate. After it drops in, your prize is revealed. Always innovative, this Microgaming a 5 reel slot that has no pay-lines, instead offering up to 243 ways to win! That's right, BURNING DESIRE presents a new and more exciting way to play, where instead of being constrained by the number of pay-lines, the player can generate more winning opportunities - up to 243 of them. “Way Wins” means that all symbols act as adjacent scatters. Any adjacent symbol combination then offers a win. The Game incorporates a completely new concept of ways, as opposed to the typical paylines. The rationale is to provide players with a new game type all together, and to attract their attention with the ability to play and win on 243 ways! It makes use of ways instead of paylines to calculate wins. Instead of a set configuration of paylines, the slot calculates wins on left-to-right combinations regardless of their position on each reel. A winning combination is any combination from left to right (starting on Reel 1) of winning symbols. In order to pay, a winning combination must begin on the first reel, and contain symbols on each subsequent reel in any position (top, center, or bottom). Burning Desire is the first Internet slot to incorporate this radical new, player-friendly development, and it features Wilds, Scatters, Multipliers and Free Spins with achievable wins of 30 000 coins in the base game or up to 90 000 coins in Free Spins. 3, 4 or 5 bright gold coins will activate 15 Free Spins with re-triggers possible within those spins, trebling wins and providing hours of red hot gaming fun. The Burning Desire logo is Wild, with huge potential for ramping up winnings by forming rewarding combinations using the revolutionary Way Wins game rules. 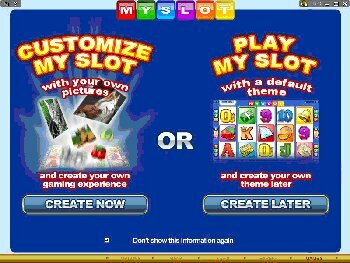 Online gaming software developer Microgaming felt that if online avatars and poker tables can be customized to a player's individual taste, then the same should apply to slot games, and this approach informed an exciting development project that culminated this week in the launch of a revolutionary video slot called MY SLOT. Revolutionary, because for the first time online gamblers are empowered to design and build their own theme. No special skills are necessary to use this revolutionary new feature, giving the player the power to select symbols, background color and even sound. The customized theme then becomes part of an action-packed Microgaming video slot that offers Wild, Scatter and Free Spin features with 3x multipliers, and the capability to generate spins within the spins to create more winning opportunities. For those players who do not wish to use the customizing function, a default version of the game can be selected that will display the game to Microgaming's usual top quality standards with a conventional slot theme, razor sharp graphics and the same exciting winning opportunities. Lucky News Network incorporates the best of the American-style second screen bonus game, combining it with the big game feel of the Australian Free Spin awards, all powered by one of the fastest, smoothest slot software engines on the Internet. The mysticism and romance of the ancient Celtic culture unfolds in this 25 line, 5 reel video slot. CELTIC CROWN offers players all the elements of a rattling good game - Scatter, Wild, Bonus and Gamble action with multiplier and Free Spin rewards aplenty. Powered by one of the smoothest and fastest slot engines on the Internet, and packaged in brilliantly colored and elegant Celtic graphics, this new offering has a large betting range up to 0.25 and presents opportunities for players to win up to 50 000.00 in the base game, double that on Free Spin earnings and a whopping 56 250.00 on the pick-your-reward bonus feature. Topping off a hard-to-beat ton of entertainment is a Gamble facility where players can bet on color and suite to double or quadruple winnings. In a theme that showcases ancient kings, ravishing redheads, singing harps and illuminated monkish script against soft green and lucky four leaf clovers, the player will find that the princess and the harp bring the best returns. When the redheaded noblewoman appears simultaneously across reels 2, 3 and 4 it opens up the second screen bonus feature - the Great Hall of King Bryan Boru where players make three choices from six of the king's kneeling knights, each with its own random prize multiplying the winning bet. The Harp serves as a Scatter but is additionally a potent generator of up to 25 Free Spins where 2x multipliers come into play and new spins can be retriggered. This progressive video slot has a medieval theme, filled with kings, beautiful queens, brave knights in shining armor, coming to the rescue of a distressed princess and a dragon protecting the Kings' Treasure in the Bonus Round. This Progressive slot features 9 paylines 5 reels and a chance to win a whole lotta money. This progressive starts at $100,000.00 with an average of $500,000 to win. The highest this slot hit was at $1,218,298.00 How awesome would that be? All you have to do is hit five Kings on the 9th pay line with a maximum bet and you could be on your way to a never ending shopping spree! The Wild symbol is of course the King and he will substitute for all symbols except the funny Jester and the dragon. The Bonus Round!! You must get 2,3, or 4 dragons to enter the bonus round. The bonus round consists of the King surrounded by treasure chests and protected by the dragon. You must choose a chest. Once you do, you are awarded with coins but the choice is up to you if you want to keep it or throw it away! You only get 3 tries. The last choice is a keeper no matter what. Looking for BIG excitement with BIG payoffs? Then Cashapillar is for you! Cashapillar is a GIANT 100 - line 5 - reel slot. You can play for some serious money with this slot game if you are willing to put out some good money. Playing pennies at maximum bet will cost you $10 per spin (which of course you do not need to play at maximum bet, if you choose not to!) Playing maximum bet can bring the BIGGEST payouts available though. The symbols are the cutest little caterpillars you will ever see! The Cashapillar is wild and will substitute for all other symbols except the Bonus Symbol and will double your win when used in a winning combination. The Cashapillar symbol appears stacked on the reels and so you may get one Cashipillar per reel up to five Cashapillar per reel and can appear on any or all of the five reels. The Bonus Symbol is a Cake with Candles on it and getting 3, 4, or 5 Bonus Symbols will start 15 Free Spins. All Free Spin wins are tripled and when the Cashapillar Wild Symbol substitutes inside of Free Spins, you can win up to 6 times your line bet! Free Spins can be retriggered.